RealTime Gaming welcomes the Chinese New Year with the early 2019 release, Pig Winner! The Chinese year of the pig symbolises wealth and prosperity. Equipped with scatters, wilds and free games, it promises all sorts of excitement with up to x2,000 bet per spin! 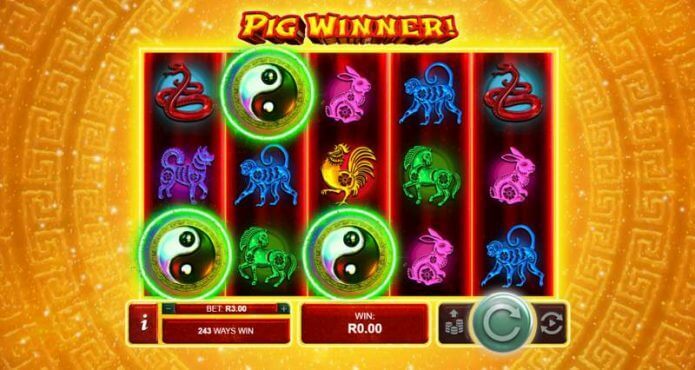 Pig Winner is based on the Chinese lunar calendar, and you’ll find the artwork faithfully reinforces this theme. The reels contain the other 11 regular symbols of the Chinese zodiac in order of decreasing payouts: the rat, ox, tiger, rabbit, dragon, rooster, horse, snake, monkey, dog and goat. The artwork is vivid, almost electrifying, found on 5-reels hovering in a fiery yellow glow from the sun behind. A traditional Chinese instrumental tune softly plays in the background which is overlaid by the audio effects released from triggered features or payline wins. The wild pig may appear on the 2nd and 4th reels, as partially or fully stacked, and substitute for any other symbol except the Yin Yang scatter. In the base games, this symbol acts as a x2 multiplier when taking part in a payline win. Three or more Yin Yang scatter symbols have the ability to unlock eight free games. While in free games mode, you’ll find more wild pig symbols, acting as x3 multipliers, and more Yin Yang scatter symbols are likely to turn up. The scatter symbol itself in sets of 2, 3, 4 or 5 will credit x1, x2, x20 or x200 total bet, but only during the free games. Free spins can be re-triggered up to 2 times. As you might expect it did take us a bit of time to trigger the free spins where you’re more likely to collect larger prizes. Pig Winner! slot game is a 243 ways-to-win game. South African players can vary their wagers from as little as R0.30 to as much as R150. Besides traditional desktop, the game exists as a mobile and tablet version, so it follows you easily on an Android or iOS device. The slot has a low to medium volatility and is pretty easy to play as there is not a lot in the way of features or complicated rules. While not possessing the best graphics, the thematic audio effects are smooth, and the prizes can be decent, though certainly not amongst the highest out there. Game description: Pig Winner! slot game is a 243 ways-to-win game. South African players can vary their wagers from as little as R0.30 to as much as R150.